What risks are Nuneaton’s Accidental Landlords taking?? In today’s economy, there are plenty of tricks you can use to save money, but some landlords are taking that a step further. According to research from LV landlord insurance, there is a surge in ‘accidental’ landlords across Nuneaton as people are attempting to boost their income by letting properties privately to save on agency fees. Over 7% of adults in Britain rent out a property to help to supplement their income and receive an average of £678 per month. This equates to almost £28bn per annum across the country. 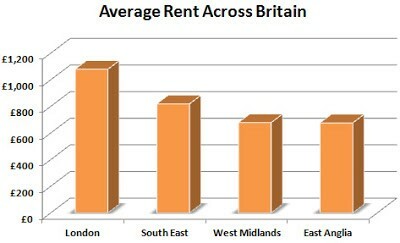 Landlords in London and the South East collect the highest (average) rents at £1,079 and £819 respectively. This is followed by the West Midlands at £678 and then East Anglia at £676. The driving force behind this trend of 55% of accidental landlords (renting out property they never intended to) varies, from wanting a bigger property (15%), moving for work (10%) or even wanting a garden (6%)! 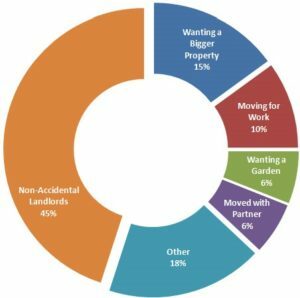 Another 6% of landlords say they ended up renting out a property because they moved in with a partner and didn’t want to or couldn’t sell their own. Whatever the reason may be, all Nuneaton landlords must comply with current regulations and legislation. All landlords must ensure that gas equipment (boilers, cookers, etc) are installed and checked annually by a registered Gas Safe engineer. All electrical installations must be safe. Tenant deposits must be held in a deposit protection scheme and some local authorities have mandatory licensing for landlords. A managing agent will usually take responsibility to ensure that all legislation is complied with, for a fee, as well as check tenants and manage the rent collection, repairs, inspections and deal with the end of a tenancy. Almost half of today’s amateur landlords manage their rental property on their own and do not have such protection. Of those self managing their properties, 27% have not had a gas safety check in the past twelve months and risk being prosecuted and fined up to £20,000. As well as exposing themselves to fines from the local authority, Nuneaton landlords could find themselves heavily out of pocket if one of their tenants decides to make a claim against them. For example, a landlord could be sued by someone who falls and is injured because a pathway has not been maintained. Landlords can also be liable for damage to adjacent properties, such as an overflowing gutter causing water damage to a neighbouring house. Analysis of the data shows that the number of liability claims being made against property owners has been steadily increasing in recent years. The insurance needs of a rented property are very different to those of an owner-occupied home. Standard home buildings insurance will not usually cover homes that are tenanted. Almost a third (32%) of Nuneaton landlords say their rental property has been damaged at some point and has had to be repaired, which has cost them £1,200 on average. 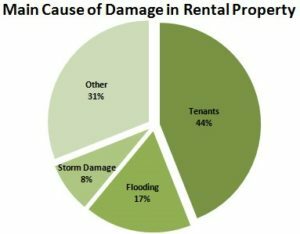 Of those who have had their property damaged, the main cause has been damage by tenants (44%), followed by flooding (17%) and storm damage (8%). 19% of those who rent out houses – equivalent to over 400,000 landlords(UK) – do not have appropriate insurance in place and might not be covered should the worst happen. Renting out a property can be a great way to cover your costs if you are unable to sell or want to hold on to a home and make some extra money from it, but it is not without risk. In order to mitigate those risks, we would always advise that you speak to a reputable agent who will help to guide you and show you how to protect yourself against many risks you may not have even considered. Is the Nuneaton Buy to Let market over saturated? If I were a buy to let landlord in Nuneaton today, I might feel a little bruised by the assault made on my wallet after being (and continuing to be) ransacked over the last 12 months by HM Treasury’s tax changes on buy to let. To add insult to injury, Brexit has caused a tempering of the Nuneaton property market with property prices not increasing by the levels we have seen in the last few years. There is even a possibility we might even see a very slight drop in property prices this year and, if Nuneaton property prices do drop, the downside to that is that first time buyers could be attracted back into the Nuneaton property market; meaning less demand for renting ( ie rents will go down). Before we all run for the hills, all these things could be a blessing in disguise to every Nuneaton landlord. Nuneaton and Bedworth has a population of 125,252(according to the 2011 census), made up of 54,167 households so when I looked at the number of households who lived in private rented accommodation the fact that there were 6480 was a surprise to me. Yields will rise if Nuneaton property prices fall, which will also make it easier to obtain a buy to let mortgage, as the income would cover more of the interest cost. If property values were to level off or come down that could help Nuneaton landlords add to their portfolio. Rental demand in Nuneaton is expected to stay solid and may even see an improvement if uncertainty is prolonged. However, there is something even more important that Nuneaon landlords should be aware of, the change in the anthropological nature of these ‘20 something’ potential first time buyers. Last weekend I attended the wedding ceremony of an extended family member. I got chatting with my cousin and her partner. Both are in their mid/late twenties, both have decent jobs in Nuneaton and they rent. Yet, here was the bombshell, they were planning to rent for the foreseeable future with no plans to even save for a deposit, let alone buy a property. I enquired why they weren’t planning to buy? The answers surprised me as an early 1980’s baby and someone who bought their first property at the age of 22, and it will you. Firstly, they don’t want to put cash into property, they would rather spend it on living and socialising by going on nice holidays and buying the latest tech and gadgets. They want the flexibility to live where they choose and finally, they don’t like the idea of paying for repairs. All their friends feel the same. I was quite taken aback that buying a house is just not top of the list for these youngsters. So, as 12% of Nuneaton people are in rented accommodation and as that figure is set to grow over the next decade, now might just be a good time to buy property in Nuneaton– because what else are you going to invest in? Give your money to the stock market run by sharp suited city whizz kids – because at least with property (it’s something you can touch) there is nothing like bricks and mortar! I was talking to my financial advisor friend the other day. He is an Independent Financial Advisor (IFA) who does both residential and commercial mortgages. Recently we completed a property portfolio review for a Nuneaton Landlord. We got talking about the current mortgage market and why Nuneaton youngsters were choosing to rent. It was fascinating listening to a different point of view which I thought my blog reading friends on here may be interested in. Some property experts are directing the current crisis towards the 55 to 70-year-old Nuneaton citizens. Also known as the ‘Baby Boomers Generation’, these Nuneatonl people were born after the end of the Second World War when the country saw a massive rise in births as they slowly recovered from the economic hardships experienced during wartime. …Yet some have suggested these Nuneaton baby boomers have, and are, making too much money to the detriment of their children, creating a ‘generational economic imbalance’, where mature people benefit from house-price growth while their children are forced either to pay massive rents or pay large mortgages. Between 2001 and today, average earnings rose by 67%, but average Nuneaton house prices rose by 187%!! So, when we roll the clock forward to today, and we can observe those very same footloose banks from the early/mid 2000’s that lent 125% with just a note from your Mum and a couple of breakfast cereal tokens, ironically reciting the Bank of England backed hymn-sheet of responsible-lending. My friend, the IFA, informed me that on every first time buyer mortgage application, they are now looking at every line on the 20-something’s bank statements, asking if they are spending too much on socialising and holidays… no wonder these Millennials are afraid to ask for a mortgage as more often than not after all that; the answer is “Computer says NO!”. Equally, you have unregulated Buy To Let mortgages. As long as you have a 25% deposit, have a pulse, pass a few very basic yardsticks and have a reasonable job, the banks will literally throw money at you… I mean Virgin Money are offering 2.99% fixed for 3 years – so cheap! 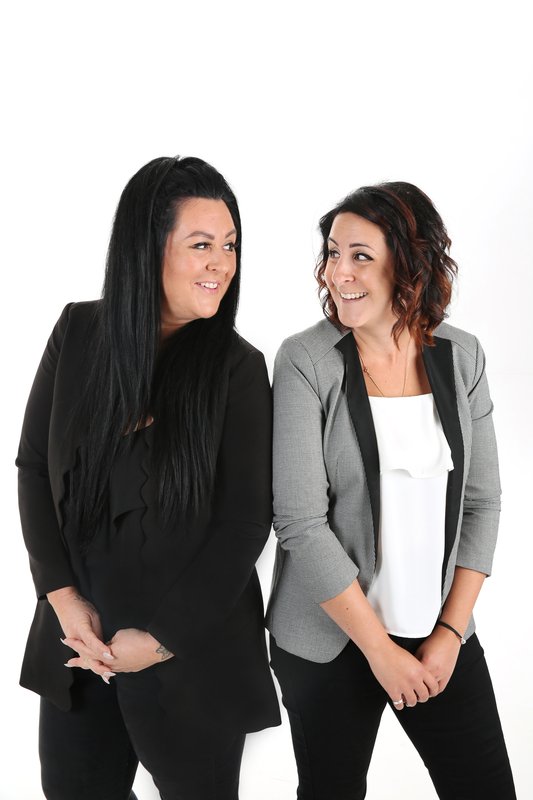 If you are a first time buyer and don’t know where to start or are already on the property ladder but need further advice, please feel free to give us a call and we shall do what we can to help you out. Alternatively, if you are in Nuneaton town, feel free to pop in and see us on Bond Street, we’re just by the train station. I’ve been enjoying yours and Mariam’s blog for some time now and have found the recent addition of ‘ASK MEL’ useful. I thought I’d write in and if it makes for blog worthy reading, please feel free to share your answer on the blog as I’m sure it will help other landlords like me. I’m relatively new to being a landlord. Truth be told, I fell into it accidentally. My situation is this- I have a tenant who pays the rent as and when she feels like it. It’s currently up to date but never paid on time or all at the same time. During the inspection of the property, not only was I extremely disappointed with how the property was being kept but, she’d also got a dog without my permission. What also annoyed me was that she lied about the dog, saying she was dog sitting for a friend but, when I asked the neighbours they confirmed it was hers and she’d had it for some time. My gut instinct is telling me that this will only get worse and I think it’s best that I start looking for a new tenant. How do I go about serving her notice? I’m really glad to hear that you’ve been enjoying the blog and finding the ASK MEL articles useful. Congratulations on falling into the roll of Nuneaton Landlord. It may not always feel like it, but you’ve made a great decision. You are clearly upset about the situation, which is understandable and, you are able to serve your tenant notice but, this should always be the last resort. I know it can sometimes be awkward for landlords to speak openly about issues with tenants, but, have you tried addressing your concerns with the tenant? If you explain to her what you expect from her, with regards to rent being paid by standing order on the same day each month because it is causing too much confusion with finances, then she may be more willing to rectify the problem as she will not want to ‘rock’ the proverbial boat. With regards to the dog, you could let her know that in getting the dog, she has breached her tenancy agreement and perhaps even your insurance? which would give you reason to serve her notice, or, alternatively, you could ask for a pet deposit. Think how much it could costs to have all the carpets cleaned, have the house professionally cleaned and possibly a treatment for fleas. We usually ask for £250 and state that it is non-refundable. If you’ve tried everything but you’re still adamant that you want to serve her notice then you will need to serve her with a Section 21 (I think this would be the most suitable notice for your situation, from what you have said in your email), which sounds simple enough. •	A Section 21 cannot be served any earlier than 2 months before the end of the current tenancy agreement. So, if you are 3 months into a 6 month AST then you will have to wait another month until you can serve her notice. 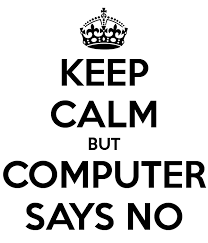 •	If you took a deposit did you protect the it in an authorised deposit scheme within 30 days of receiving the funds? •	Did you provide the tenant with the prescribed information within 30days of receiving the deposit? •	Have you provided the tenant with an up to date Gas safety certificate and EPC? •	Did you provide the tenant with a copy of “How to rent: the checklist for renting in England”? If you have answered NO to any of the above questions (and your tenancy started after 1st October 2015), it is likely that your S21 possession claim will be rejected if it goes to court. The above questions are but a few steps that landlords often forget to do and, as a result, can cause a lot of grief when it comes to regaining possession of your property. If you do fall into this category, then it is certainly worth discussing further to see exactly where you stand. I am happy to answer any questions you have. If you’ve answered yes to all of the above and the tenancy is due to end in the next two months or is on a rolling contract then you can proceed with serving notice. If you are not entirely confident in making sure it is served correctly, just give me a call on 02477 674 545 and I’ll help in any way I can. As I don’t know the entire background of your situation, I do not want to assume one thing or another. There are a lot of things to check before serving a Section 21, but I have covered the most common problems above. Hopefully you’ve found my answer helpful but, if you would like to discuss this further, please feel free to get in touch. We’re happy to help. For anyone else reading this article- you may want to serve notice on your tenants for completely different reasons. I have tried to cover what I think to be the most common causes of failed S21 claims but, please ensure that you do your research or, if necessary, seek legal advice before serving notice to ensure you achieve possession of your Nuneaton rental. A Section 8 notice may be more suited to your situation and, depending on the grounds you can serve notice at any point during the tenancy and could have court date within 2 weeks to claim possession. Court Fees can be costly so you want to make sure you have a good case if it goes that far. If you are looking to have you property managed to save you the ‘hassle’, then rest assured, we do serve relevant notice’s to tenants (if they are in breach of their contract) as part of our fully managed package. If you would like to discuss this further then please get in touch. ASK MEL – What certificates do I need, by law, for my Nuneaton Buy-to-let at the start of a tenancy? I’ve been reading up on the kind of documentation / certification that is required at the start of a tenancy but I’m a bit confused about what is a legal requirement and what is recommended. I’ve just purchased my first buy-to-let in Nuneaton and I want to make sure everything is done properly. Thanks for getting in touch and congratulations on your first Nuneaton buy-to-let. This is an incredibly exciting time but also a worrying one, as you said, you want to make sure you’re doing things right. It’s great to see you taking pride in your investment and taking the time to check what is legally required from you because it can be VERY costly if you are caught out or miss something. As you said, there are legal requirements and then there are recommendations (I’d personally do what is recommended as best practice). This is a certificate which you are required, by law, to have done annually. It must be carried out by a registered Gas Safe Engineer. You need to give tenants a copy of this at the outset of each new tenancy. When the certificate is renewed, you should also provide the tenants with a copy. The cost varies from £45 – £85 Depending on who you use. Just make sure they are on the Gas Safety Register. Surprisingly, unlike gas regulations, there is no law that says you must have a landlord electrical safety certificate. You must make sure that any appliance you provide is safe (complete a PAT test) and has at least the CE marking (which is the manufacturer’s claim that it meets all the requirements of European law). But, I would certainly recommend having an Electrical Certificate done. Should any electrical fittings or appliances within your rental property cause harm to a tenant you could be held liable. It is recommended that they are done every 5 years or at the start of each new tenancy. The cost of this is usually around £120-£150. As a landlord, it’s your job to keep a house safe and free from health hazards. This also includes Legionella which is a type of harmful bacteria found in water and can cause a serious type of pneumonia (lung infection). You have two options: 1) Instruct a company to do the assessment for you (usually around £50) or 2) Carry out the assessment yourself if you are able to complete it competently. This certificate shows the energy efficiency of your property. It grades the property from A-G and also highlights ways in which you can make improvements. You will have had one when you purchased your property. Check the date it was done as they need to be renewed every 10 years. As of April 2018 an rental property will need to have a minimum E Rating so, if your property is one of the older or poorly insulated properties, you may struggle (unless certain improvements are made- if they can be). A copy of this needs to be given to the tenant at the start of the tenancy. Now, although this isn’t a certificate, I thought you should know that it is a legal requirement to have one smoke detector on each storey of your rental property and a Carbon Monoxide detector must be fitted in an room where solid fuel is used (e.g. log burner). As best practice, I put a Co2 detector in any room that has gas (where boiler is, if there is a gas hob, if there is a gas fire), but that is up to you. So there you have it, a list of certificates that are either required by law or recommended. There are other things to consider at the start of the tenancy like the inventory, protecting the deposit, providing the correct documentation at the start of the tenancy. If you have any questions about any of these, or if you’re considering using an Agent to ensure it’s all set up and running smoothly with the right tenants, feel free please feel free to get in touch. Email me on m.maycock@qthomes.co.uk or give me a call on 02477 674 545. You’re always welcome to pop in for a chat. The kettle is always on and we may even get the biscuits out. We’re just by the trainstation.